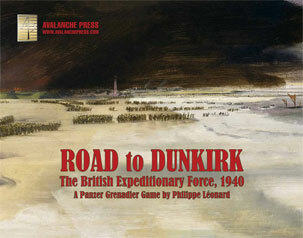 With Panzer Grenadier: Road to Dunkirk, Philippe Léonard’s long-awaited sequel to 1940: The Fall of France finally reaches print. It follows the story-arc format we’ve been using for our tactical games, and with such a dramatic story to tell it’s particularly well-suited. The 47 scenarios are organized into six chapters, and five of them have “battle games” linking the scenarios together. This isn’t an old-style tactical wargame, with a dozen more-or-less randomly-chosen scenarios tossed into a box and called complete. Nor is it the sort of game we once produced, with a huge number of scenarios tossed into a box. The scenario tell the story: you can play each individually and get the same gaming experience you would have in the old format, but you also can play (or just read) them in sequence and watch the story unfold before you. Philippe’s work is particularly well-suited to this approach. We’ve published Panzer Grenadier games that required a fair amount of additional research (by the developers or by me, or both) to complete the story. Not with Philippe Léonard. He has a deep understanding of the campaign and makes use of extensive primary and secondary sources in multiple languages; in editing his work I have to pare down the detail, not bulk it up. The war in Western Europe from the commencement of the Polish campaign in September, 1939 until the invasion of Belgium in May of 1940 was contemporaneously named “Sitzkrieg,” “the Bore War” or “The Phony War.” Regardless of the name, the period was characterized by a lack of major offensive activity as both sides remained in their fortifications (the Siegfried and Maginot lines) and waited. While it wasn’t a particularly contentious period, both sides patrolled the area between their fortifications and this provided the opportunity for units to become acquainted with combat. With the British Expeditionary Force primarily stationed along the Belgian border the only British troops to participate in this phase of the conflict were the Saar Force, primarily composed of the 51st (Highland) Division commanded by (no, really) General Fortune, although several other units were rotated through the area to gain front-line experience. Regardless of the sharp fights conducted in no man’s land, it’s unlikely that any participants felt prepared for what was to come. The 51st Highland Division had moved to the Saar front to defend the border with Germany, in French territory some eight miles ahead of the Maginot Line. On 10 May German infantry attacked their forward positions, probably as a feint to fix as many Allied troops as possible in that otherwise quiet sector. B Company of the 4th Black Watch was holding positions at Betting when it came under attack. The enemy was supported by a “box barrage” which prevented the arrival of reinforcements. Lt. Col. R.C. Macpherson, commander of the 4th Battalion, Black Watch, ordered 2nd Lt. A.S. Chambers and the Lothians’ tank troop to advance to Betting and aid Post Number 9. Chambers’ tanks went into action in the area around Grossenwald woods. He was ordered to move his troop around the left of the woods and try to outflank any enemy patrol or machine gunners lying out in front of the woods. Carriers from the Black Watch were to carry out the same operation on the right. However the ground in front of the Grossenwald proved too wet in places even for the light Mark VIb tanks. One tank was bogged down 20 yards from the wood and another had both tracks blown off some distance out from the wood and in full view of the German outposts. The carriers’ action eventually forced a German retreat but it was not a good start for the British tanks. As befits the game’s first scenario, this is just a small battle with the British attempting to drive off the Germans who’ve advanced a bit too far for comfort. It does have a handful of unusual special rules, which I usually prefer to see appear later in the scenario set, but they’re pretty easy to use. The Brits here are the Black Watch, and that means they have morale at Israeli levels. Heavy shelling began at 0415, prompting Macpherson to send Lt. J.R. Johnston with his tank troop from 1st Lothians to the Falstroff - Bizing road to support the border posts in case small arms fire should break out. Black Watch carriers also moved up to support the front line, but the heavy shelling had spread confusion throughout the British positions. Since the Grossenwald posts were being heavily attacked, the tanks and carriers went north to give assistance. The Black Watch company holding Betting had been fighting off German infantry trying to envelop the town since 0430. When the British tanks arrived to support the defense, one of them became bogged down while bypassing a German roadblock. The other tanks proceeded up to Grossenwald and through the woods, harassed by a few shells and some machine-gun fire. When the first tank came into view of the enemy, a German anti-tank gun immediately scored hit, wounding the gunner in the leg and knocking off the track, sending the tank out of control. More shells soon hit the tank turret, killing the wounded gunner and jamming the guns. A second tank eased around the edge of the wood and through the wire only to be knocked out in very similar fashion. The surviving crewmen wandered in the Grossenwald for some hours before stretcher parties retrieved them, the British cavalry’s first casualties of the war. The British have that fantastical Black Watch morale and they have tanks. Unfortunately, they’re really bad tanks (that's a picture of one right up above), and even the puny German anti-tank guns can make them blow up real good. The Germans also have massive artillery support. The Germans have a pretty high bar to cross for victory, but they’ve got plenty of tools with which to work. The Sitzkrieg ended with the initiation of the German assault. The 51st Division was not involved in Belgium and did not have the experience of Dunkirk. It did, however, get its fair share of Blitzkrieg later in the campaign in France, a story we will pick up later.